LOS ANGELES, CA –Equity Alliance for LA’s Kids, a coalition of three organizations including Advancement Project California, Community Coalition and InnerCity Struggle, congratulates new Superintendent Austin Beutner on today’s appointment. As Michelle King leaves, we share our appreciation on the steps she made towards educational equity. And we thank LAUSD Board Member Monica Garcia for her leadership moving us forward. “We are looking forward to working with the new Superintendent of Schools and all the key stakeholders to ensure all our kids succeed academically,” states Maria Brenes, Executive Director of InnerCity Struggle. By unanimously passing the Equity is Justice 2.0 resolution, Los Angeles Unified School District’s Board took bold action and made a clear statement: that educational equity and our high and highest-needs schools matter. We look forward to working with the district on the implementation of the resolution and sharing out evidence-based practices to support student success and ensure that these dollars are spent responsibly. The resolution is already at work. We understand the district has taken initial steps on the 2018-19 implementation. 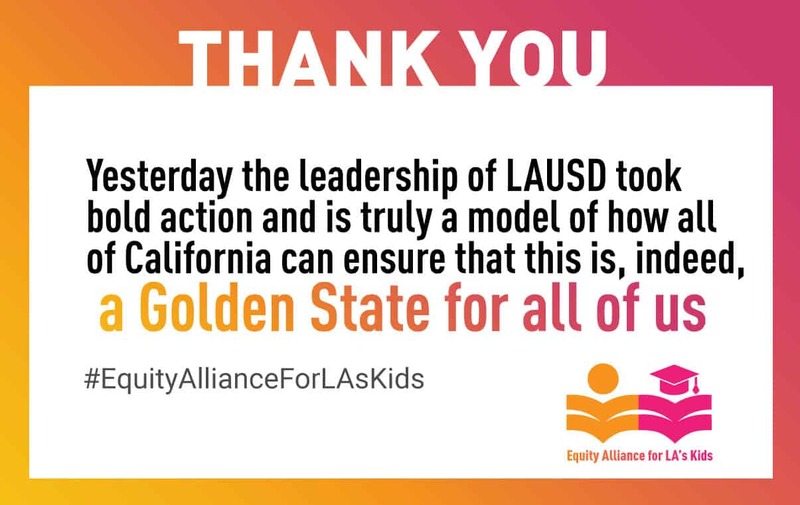 We look forward to the resolution taking full effect in the 2019-20 budget, and as such, the Equity Alliance for LA’s Kids plans to offer guidance in the form of a menu of options for schools as they plan their budgets and determine the most effective way to allocate the funding they will receive. “Schools will be able to use the funding to combat the negative effects of asthma, gun violence and trauma on students, with academic programs and mental health support. We are committed to continuing working with the LAUSD leadership to ensure a public education system that works for all students,” stated Aurea Montes-Rodriguez, Executive Vice President of the South L.A.-based advocacy group Community Coalition. “We’re pleased the school district has already moved to allocate and inform schools regarding the initial $25 million. As this happens we are researching evidence-based practices and look forward to working with the district on a menu of options for the all-new dollars under the Equity is Justice 2.0 funding formula,” states John Kim, Executive Director of Advancement Project California. For nearly 30 years, Community Coalition has provided a hub to elevate South LA’s voice and empower residents to take control over the future of their neighborhood. Community Coalition works with residents to build a prosperous and healthy South LA with safe neighborhoods, quality schools, a strong social safety net. The coalition continues to work on the positive economic development that reduces crime, poverty and substance abuse in South LA through resident organizing, direct advocacy and community support services. Visit www.cocosouthla.org to learn more.